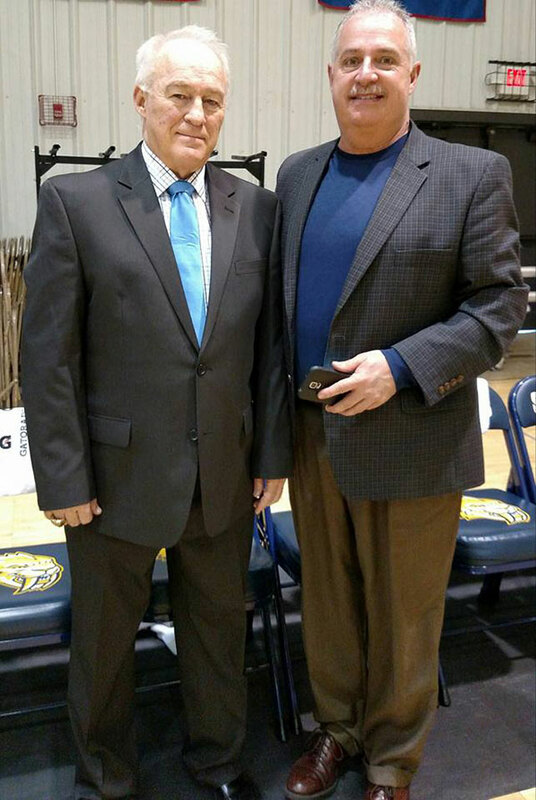 Two Cedar Springs men, Gary Bailey (right) and Dan George (left) are the head coach and assistant coach for the men’s basketball team at Grace Bible College in Grand Rapids. Last weekend they celebrated their ninth regional championship. Two Cedar Springs men continue to build the basketball tradition at Grace Bible College—winning nine regional championships in 11 years of coaching. But the twist in the tale is this: in the beginning, they didn’t intend for the coaching jobs to be permanent. 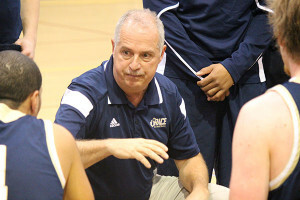 When Gary Bailey, of Cedar Springs, took over as head coach of the Grace Bible College men’s basketball team in 2005, his intention was to take the job for a year. His son, Kirby, was a senior and an All-American for the Tigers, and Bailey saw his role as a transition one for that one year. He called his former college coach and long time friend, Dan George, currently school leader and superintendent at Creative Technologies Academy, and asked him to be his assistant. Reflecting on that request, Dan explains, “I said, OK, I’ll do it for a year.” But the Tigers surprised everyone that first year, transforming a mid-season mediocre record to an overtime regional championship victory, and then went on to shock the national tournament’s #2, #3, and #1 seeds in successive games and won the national championship on a last second buzzer beater tip in by former Cedar Springs High School player, Jimmy Booth. The Grace Bible Tigers celebrated winning the regional championship last weekend, and are poised to win it all this season. One year has been extended to 11 and the two show no signs of retirement, yet. This past Saturday, the Tigers won their ninth regional championship in those 11 years with a dominant 79-49 win over Maranatha Baptist University. Bailey was named regional coach of the year for the seventh time to go with two national coach of the year awards and the prestigious Basketball Coaches Association of Michigan College Coach of the Year in 2011. Bailey and George added a run of four consecutive national championships in 2009-2012, which included a streak of 69 consecutive NCCAA victories, a record that most people in the NCCAA say will never be broken, and brought their total to five rings in 10 years, and this year’s Tigers appear poised to challenge for a sixth. The Tigers have become a highly respected small college program with a reputation of a willingness to play anyone, anywhere, and being competitive when they do. Signature wins in the last eleven years include victories over Ferris State University, Davenport University, Cornerstone University, and perennial MIAA powerhouses Calvin College and Hope College. 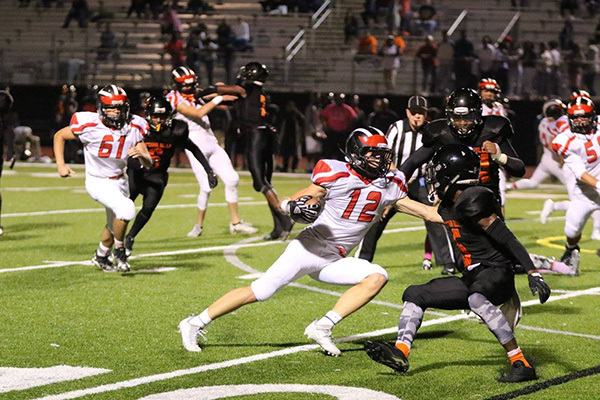 Although the small school does not give athletic scholarships, their schedule annually includes a number of high profile programs that do give athletic scholarships, and Bailey and his coaches have been able to assemble and develop some outstanding talent in the last 11 years. This year’s schedule included Coastal Carolina University, an NCAA Division 1 national tournament team last year, several NCAA Division II schools, including two in Honolulu, Hawaii, and Grand Valley State University, Northern Michigan University, and Saginaw Valley State University, and several NAIA programs. The Tigers also played a preliminary game at the Palace of Auburn Hills on the night the Pistons retired Chauncey Billups’ jersey. The guarantees provided by playing these larger schools help fund the Tigers’ ambitious travel schedule and the tough schedule helps them attract and develop talent that other schools have overlooked. One of those overlooked players was Allen Durham who played high school ball at Wyoming Park High School, won three national championships at Grace, spent most of this year with the Dallas Mavericks organization, and is now starring in professional play in France. Most of Grace’s high profile games are played early in the season and toughen the Tigers in preparation for the very difficult NCCAA games and end of the year tournaments. There is little doubt that the success of the men’s basketball program has had an impact off the court as well. The college was recently recognized as the fastest growing Bible college in the United States. The coaching staff has also emphasized community service and the team tackles several projects a year. One of their favorites is an annual visit to Pineview Homes, a home for delinquent, abused, and neglected boys in Evart, Michigan. Each Christmas season, the Tigers spend several hours with the boys in an afternoon and then attend their Christmas party and dinner. Pineview Director Paul Derscheid, says it is something the boys talk about weeks before in anticipation and months afterward they are still wearing their autographed Grace shirts. Both coaches are members of the Grace Athletic Hall of Fame with Bailey being inducted in 2013 and George being inducted in 2014. While acknowledging satisfaction in the accomplishments and appreciation for the awards and recognition, Bailey is quick to give credit to those who have assisted in this journey. 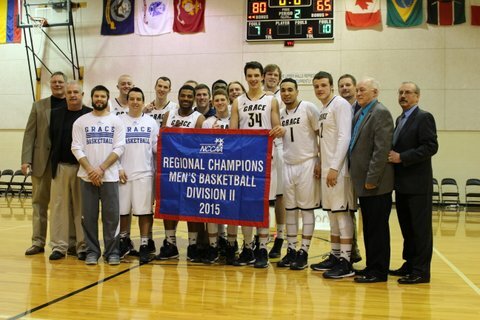 Gary Bailey, of Cedar Springs, and head coach of the Grace Bible College Tigers mens basketball team, was named Regional Coach of the Year. 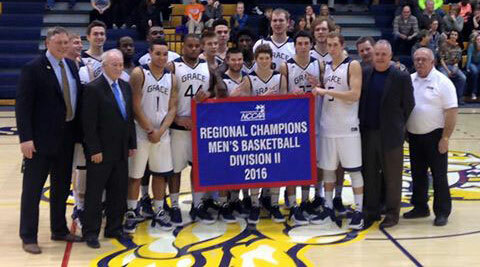 The Grace Bible Tigers won their regional championship and will play in the national tournament this week. They are coached by Cedar Springs resident Gary Bailey, (second from left.) CTA principal Dan George (second from right) is an assistant coach at Grace. Gary Bailey, Cedar Springs resident and head coach of the Grace Bible College Tigers men’s basketball team, was awarded his second consecutive NCCAA DII Midwest Regional Coach of the Year honor last weekend. This is the sixth time Coach Bailey has received the award in his 10-year collegiate coaching career. He has led the Tigers to a 19-13 record so far this season, including a Regional Championship Title and an appearance to the upcoming NCCAA National Tournament on March 12-14. 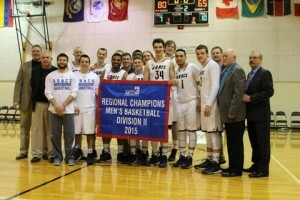 The Tigers clinched their regional championship last weekend, when they defeated Maranatha Baptist University 80-65. The win earned the Tigers a guaranteed bid to the NCCAA DII National Tournament held in Circleville, OH at Ohio Christian University.